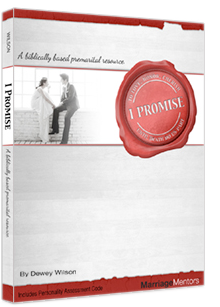 I Promise is a biblically-based premarital resource designed to help dating or engaged couples prepare for marriage. We intentionally designed I Promise to engage each participant both individually and as a couple by using thought provoking questions about biblical truth, each other’s unique personalities and their life experiences. The online I Promise experience comes complete with personality and relationship assessments, as well as provides facilitators with dynamic online support while using I Promise in a group or individual couple setting. Sessions include topics like covenant commitment, roles in marriage, communication, conflict resolution, forgiveness, sexuality and finances. Each workbook includes a code for taking the online "Uniquely United Assessment," which helps couples better understand each other’s unique personality, strengths, and communication keys and barriers. The result is a couple better prepared to experience God's design for marriage.